This is pretty cool: a robotic wheelchair that automatically follows a human companion without the person sitting in the wheelchair having to do anything. Just like the Museum Guide Robot we’ve shown you earlier today, the robo wheelchair is the brain child of Saitama University‘s Human-Robot Interaction Center. The way it works is that a built-in distance sensor and camera system tracks the position of the companion’s shoulders, anticipates the direction the person wants to go based on that, and follows him or her accordingly. As a side effect, it’s easier for the person sitting in the wheelchair to communicate with helpers as they can walk along instead of pushing the wheelchair from behind. 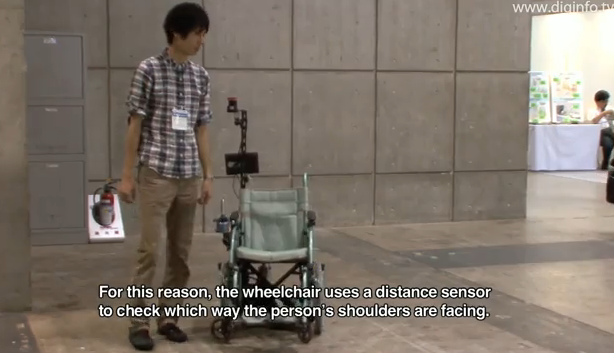 The wheelchair can also automatically avoid obstacles, for example people coming the other way. What’s also cool is that, according to the makers, it’s even possible to let two of the wheelchairs follow a single companion.